Read about Dan & Dr. Bilal’s conversation! 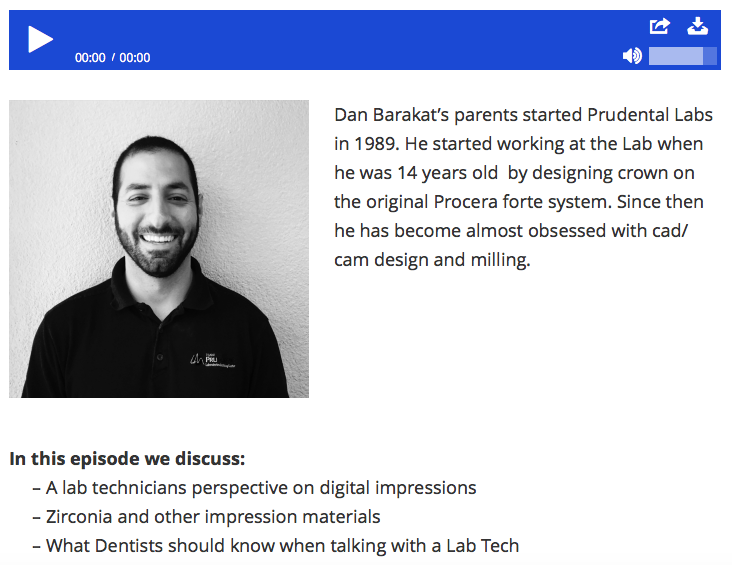 Tell us a little more about Prudental Lab. We are a full service dental lab and we focus mainly on crowns and bridges. Most of our accounts are corporate accounts so we are really able to negotiate really good pricing on material that is made here in the US. We are able to get products that are FDA approved because of the negotiating power that we have & are able to offer good competitive pricing to our doctors. Some doctors look at our prices and think that we outsource, but everything is made here in Santa Ana. We don’t outsource anything. We have about 100 employees here and most have been here since the beginning and we have very very low turnover on employees. We really specialize in customizing doctors accounts, so for example you have certain doctors that want certain materials or a certain stain, and we have that all programmed in and we give the accounts to certain technicians. So if you set up an account with us, it will be the same technician everytime for your case so that way if there are any issues, the technician knows you and you know the technician. We are a big lab with a small lab feel. How do in-office milling systems affect you as a business? I does not affect us as much as we thought. At first when we heard about it, we were a little concerned but then we came to realize that most offices that have them, don’t use them anymore. Most doctors don’t want to have a lab in-house. The doctors that do high volumes with us don’t want to deal with the price of a machine, burrs, or the noise whirring in the background of the office. What do you see that dentists could do better? Be more open minded when talking with a technician. A lot of times I will call a doctor and tell them what I see and it’s like I just insulted their mother. That’s the main thing I deal with on a constant basis. Dentists do not want to hear criticism. Another thing is, to spend a little more time getting it right the first time. It is cheaper to do it right the first time, instead of shipping and seeing the patient again and I tell that to my technicians as well. I tell them to spend a little more time reading a lab slip, checking the margin, and checking the shade.